I am an east-Londoner and I have been since I set foot on these fair shores 13 years ago. Every property I have ever lived in (only three, to be fair) has had a post-code starting with the letter E, as have two of the three companies I have worked for. I love the sens of history and the undiscovered pleasures of the “Far East” and the unadulterated terror that flickers across the faces of west-Londoners as they stammer: “So… you live east of Canary Wharf? ?”, as if the tube map after Tower Bridge gently tapers off into the words “Here there be dragons”. But I really shouldn’t laugh – I break out in hives every time I have go anywhere near Sloane Square. Part of it is my memory of being in the suffocating crush of people attending the Chelsea Flower Show that always floods the station and makes the roads impassable, but mostly it’s the fact that Sloane Square seems to be the last outpost of any sort of rail transport for miles around. Many’s the time I have walked down King’s Road with blistered feet and soaked to the skin with an inside-out umbrella, cursing the lack of sensible public transport and vowing never, ever to return. So it’s a good thing, then, that The Botanist is an easy hop-skip and jump from – practically next door to – Sloane Square station. I have spoken before of having a bit of a soft spot for the excellent gastropubs operated by the ETM Group, a group founded by brothers Tom and Ed Martin back in 2000 and which now operates 10 venues across central London. I have previously had the pleasure of dining with them at The Angel & Crown, The Gun, the Cadogan Arms, the White Swan, The Well and the Chiswell Street Dining Rooms, so when Michelle invited me to join her for a meal at The Botanist, I didn’t have to be asked twice. 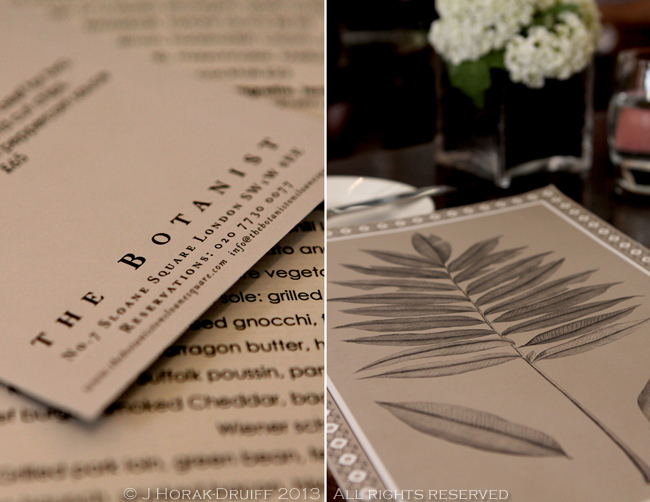 The Botanist opened in 2008 and occupies a prime corner site with floor to ceiling windows overlooking leafy Sloane Square. On the one side is an airy high-ceilinged bar an on the other, a gorgeous restaurant in pale wood with cream leather banquettes and a fabulous back-lit picture wall of panels featuring sketches of exotic plants from the journals of botanist Sir Hans Sloane. On both sides, there are masses of attractive, expensive-looking Sloanes, and the people watching opportunities are limitless. The menu is along the same lines as their other restaurants – carefully sourced ingredients served as classic dishes, with nothing that will scare the horses too much. Service was excellent from the moment we arrived – smiley, accommodating and knowledgeable. I enjoyed a glass of prosecco while debating what to order, and nibbled on some outstanding warm mini loaves of bread. There was much to like on the starters menu but eventually I settled on a plate of Serrano ham with celeriac remoulade (£11). This was a generous portion of excellent, nutty ham but I do wish they had been a little more generous with the celeriac remoulade, which I had to ration in order to make it last until the ham was finished. Michelle’s truly magnificent lobster cocktail (£22) had seemed expensive on the menu but as soon as you caught sight of it, you realised that it was worth every penny. Atop a bed of lettuce and smaller chunks of flesh lay a whole, perfectly intact shelled lobster claw – about as indulgent as shellfish gets. No wonder fellow-guests had stared as the waitress brought it to our table! Elsewhere at the table the Botanist seasonal salad (£15 – not pictured) with was an exercise in gorgeous plating with the baby radishes (tops still attached), goat’s cheese, olive “soil” and toasted hazelnuts arranged to look like vegetables growing in a garden. For our main courses, we our table diverged widely in our orders. Being somewhat of a sucker for seabass, I had the pan-fried fillet of seabass, sautéed gnocchi, fennel, peas, chive beurre blanc (£26). I could not have made a better choice – the fish was just cooked and juicy; the flavours of the vegetables and herbs gave the dish a fresh lift; while the buerre blanc and sautéed gnocchi added a note of decadence. The consistency of the gnocchi was sheer culinary bliss – pillowy inside and lightly caramelised on the outside. Michelle was feeling carnivorous and chose the classic steak tartare (19). The mouthful I had was delectable – correctly seasoned and redolent with beefy flavour. Elsewhere at the table, the roast loin and braised breast of lamb, Heritage carrots, roast corn, broad beans, confit garlic jus (£28) both smelt and looked delicious and was pronounced incredibly tender and flavoursome; while the grilled Scottish salmon was served with globe artichokes, asparagus and a deliciously runny-yolked poached egg (£26 – not pictured) managed to inflict immediate order envy on me. Side dishes, so often a neglected afterthought on restaurant menus, are both carefully considered and generously portioned at the Botanist. We had a tomato and onion salad (£4) with full-flavoured beef tomatoes (not pictured); Chantenay carrots, chervil butter (£4) which were adorably miniature and packed with sweetness although without much chervil flavour; steamed broccoli with Hollandaise sauce (£4) which was perfectly al dente and made indulgent by the excellent creamy sauce; and everybody’s favourite the petit pois à la Française (peas with bacon, baby onions, lettuce and cream – £4) which managed to turn the humble pea into a sinful indulgence. Who knew! Purely in the interest of reasearch (!) we also ordered a selection from the dessert menu. I could not resist the lure of the chocolate marquise, honeycomb, salted caramel ice cream (£5.50) . The Chocolate marquis itself is a finger of cake layers interleafed with dark chocolate ganache and (in this instance) coated in dark chocolate. It’s rich – very rich – but oh so good. The salted caramel ice cream was properly flavoured and who can resist honeycomb? An added bonus were the sprinkles of caramel popping candy on the plate which turns me into a grinning 5 year old instantly. Elsewhere at the table, a classic peach Melba (£5.50) was served in a tall sundae glass and pronounced excellent, while I was forced to help Michelle out with her European cheeseboard with quince chutney and oatcakes (£18.50, for 2 persons) – five different cheese from soft goat’s to tangy hard cow’s milk and everything in between. The quince chutney turned out to be membrillo – my favourite accompaniment to hard cheeses, and all the cheese were marvellous. With our coffees and teas (bonus points for their proper fresh mint tea) we also got some sweet nibbles including cubes of not-quite-salty-enough salted caramel and some ridiculously dense and melty bitter chocolate truffles – definitely my favourite. Our lunch guests (Michelle’s parents) pronounced it to be the best meal they’d ever enjoyed during the course of numerous visits to London and I must say that it was hard to find fault with any aspect of the afternoon – from the setting to the service to the dishes. We enjoyed their lunch and dinner menu, but they also serve breakfast, afternoon tea on weekends, and very reasonably priced pre- and post-theatre menus (2 courses for £21 or 3 courses for £26). Our meal would have cost about £70 per head if you threw in some wine which is not terribly cheap, but if you have a couple of hours to kill in west London and you like your people watching to take place in a well-heeled environment over a plate of something delicious, The Botanist is the place for you. Click here for Michelle’s review of our lovely meal. DISCLOSURE: Michelle and I enjoyed this meal as guests of The Botanist but I received no further remuneration to write this post and all opinions are my own. Looks great, funnily enough I’ve never been to the Botanist, though I have been to Chiswell St dining rooms (which is the other side of town for me) a couple of times now. Chiswell Street Dining Rooms is quite close to my office and is also v lovely… The Martin brothers certainly know what they’re doing! Could have spent all afternoon lingering at The Botanist watching people! I’ve been stuck on the picture of the chocolate marquis and I can’t take my eyes off it! Omg! It was pretty wonderful – not cheap, but then I guess most people visiting aren’t paying in SA Rands 😉 Compared to other London restaurants, it’s mid-range – definitely not a very pricey restaurant relative to what you might be paying at Michelin starred places. I love the ETM group, so consistent in quality. Well done for researching the desserts thoroughly. Wow – looks fantastic! The desserts especially. Funny that the east/west divide is just as strong as the north/south one in London. I guess it’s such a big city that you just have to divide it up into more comfortable segments to feel at home. I was a South Londoner by predilection, but did share a flat in North London for several years, which meant quite a lot of driving through the centre of town, often including Sloane Square. Back in the days when you could drive through Central London without it costing an arm and a leg of course. I was never a Sloane, but we did spend a fair amount of time in the King’s Rd as it was a quick leap over the river from Battersea, where we lived in a photographic studio near the power station for several years. London really is just a string of villages – and people venture surprisingly little outside their comfort zone! I think that, being immigrants, Nick and I are far more inclined to be willing to travel anywhere for a meal or to visit friends – some Londoners get quite huffy when you ask them to leave their quadrant! London is such a collection of villages, North vs South and East vs West. I’ve done East and West and whilst in the latter often went to the Botanist (mainly for brunch or lunch). Always lovely food and nice atmosphere. They have an outpost at Kew gardens (or did when I was in London) but that might be way too far out West for you!